If you're like us, the smallest auto paint scratch leaves you permanently cringing. Pride of ownership applies to more than just your home. Fortunately, Capital Collision Center offers car paint repair for small and large blemishes. We work quickly to make your vehicle look as good as new following an accident. An auto collision can leave you with a range of responsibilities. You might have to deal with insurance coverage, police reports, and potential hospital bills. You may begin to feel overwhelmed in a short amount of time. 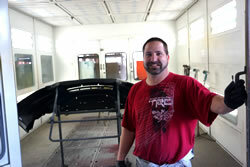 If you are also dealing with a damaged paint job, turn to Capital Collision Center. All you have to do is make an appointment and we will take care of the rest! Our goal with each of our services is 100% customer satisfaction. Auto paint repair is no exception. That's why we exclusively use PPG paint-the industry's highest quality of paint. 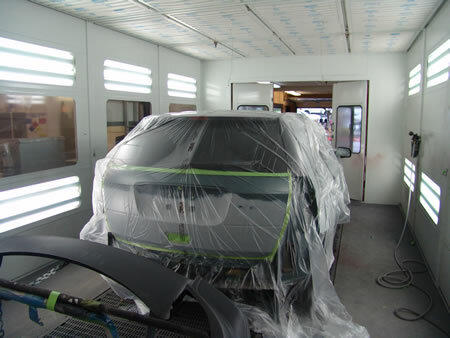 Our auto painting facility includes a 64-foot spray booth that meets all safety and OEM requirements. You'll also find high-tech mixing equipment at Capital Collision Center. We invest in quality machinery to achieve the best possible match for your vehicle's paint. Take a look at the pictures to the right for a view of our down-draft paint booths and bake ovens. If you have been in an accident, big or small, and need auto paint repair, call today. As your one-stop-shop, we also provide collision work, fiberglass repair, and aluminum repair. Reach our Olympia, WA auto shop at 360.357.5210. Once you've made contact, we can answer any of your questions. From there, we'll make an appointment to get your vehicle repaired quickly. If you have questions about pricing, visit our estimating page. We can provide an estimate for your vehicle in 20 minutes.